P-36 Lightning in flight. USAF Photo. The P-38 Lightning was Lockheed's first military aircraft and became one of the most effective fighters of World War II. A long range, twin engine turbo charged, twin boom fighter, it was easily identified by friend and foe alike, earning it the job of fleet protection in the Normandy landings on D-day (the Navy did not shoot down a single Lightning on D-day, not so for other Allied aircraft). Its twin tail booms were so distinctive that the Germans gave it the nickname of Gabelschwanzteufel, which translated means Fork-Tailed Devil. Advantages of the twin-boom was the ability to install armament in the nose which was free of propellers and with the raised cockpit, the pilot had an excellent, unobstructed view. Proving to be quite versatile, it also was used as a fighter-bomber, a night fighter, for photo reconnaissance and was experimentally fitted to carry torpedoes, although I did not find evidence that it ever carried torpedoes in combat. Although USAAC specifications were given in 1937 for a a high-altitude interceptor, the aircraft did not enter service until 1941, as the P-38D model. The biggest of the single seat fighters, the P-38 had a fifty-two foot wingspan and was equipped with two turbo-charged 1,600 hp Allison V-1710-11/113 in-line piston engines. 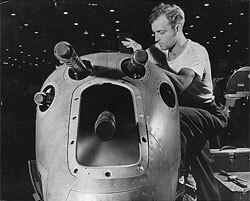 Factory work in progress in the installation of machine guns in the nose of a new Lockheed P-38 Lightning in 1942. Photo from the Collection FDR-PHOCO: Franklin D. Roosevelt Library. Armament for the P-38 included one 20mm Hispano AN-M2C cannon, and four .50 caliber Browning machine guns all in the nose. In addition, it could carry up to 4,000 pounds of bombs or ten 5 inch rocket (R.P.) projectiles under wing. 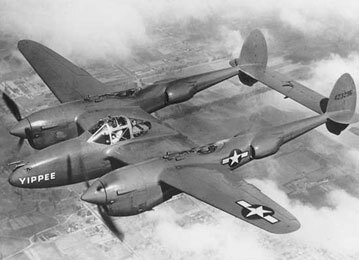 Various versions of the P-38 were produced throughout the war and included the J and L two-seater models. These could carry a bombardier with a Norden Bombsight in the modified glazed nose, which was missing the usual machine guns. Thus equipped, the aircraft (sometimes called the pathfinder) would lead formations of P-38s armed with bombs to their target, and after taking sightings, the bombardier would signal the rest of the formation to drop its bombs all at once, a technique that proved quite successful. Because of its appearance, this version was nick-named droop snoot (also spelled droopsnoot). USAAF training video: P-38 Lightning Characteristics. The high performance of the P-38, however, did cause serious problems with compressibility at high altitudes. (Compressibility is the change in air volume when it contacts the leading edges on a plane and causes air to move faster in these areas). Dives in the aircraft at speeds above 500 mph caused the compressed air to reach the speed of sound, at which point the pilot could no longer control the aircraft. Since temperature (as well as altitude) lowers the speed of sound, the cold weather in the European theater became problematic for the P-38 as a high altitude fighter, however, it proved worthy in ground-attacks and reconnaissance in this theater. The warmer temperatures in the Pacific and lower altitude fighting allowed the Lighting to give excellent service in this theater. Produced, and in service continuously throughout WWII, the Lighting's success made it one of the most famous US fighters of the war. The P-38 proved excellent in gaining air superiority in the Pacific, and was the aircraft flown by American fighter aces Richard Bong, Thomas McGuire, and H. McDonald. But with the coming of the jet age, the P-38 Lightning became obsolete, with the last aircraft being retired in 1949.